This summer my husband spoke at a church conference in London. What a wonderful blessing it was to participate in this conference and to visit London. 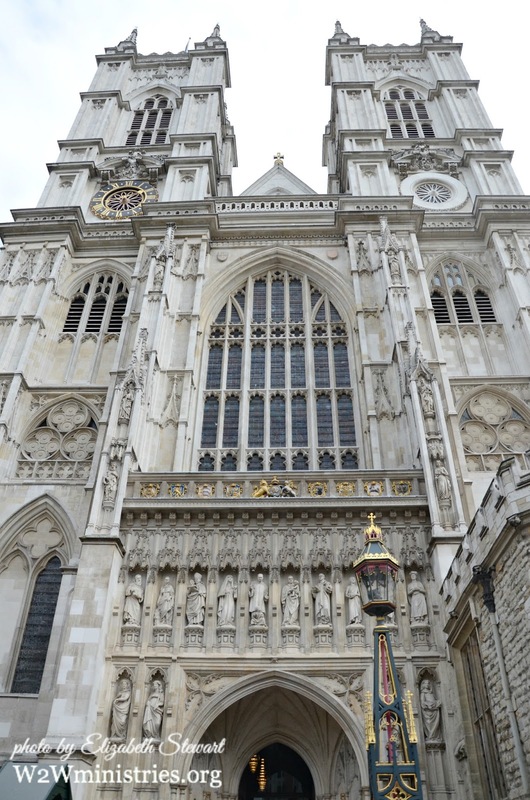 Of all of the amazing sights we crammed into our nine days there, one of the most meaningful was our visit to Westminster Abbey. No photography is allowed inside, but if you've watched any of the royal weddings you have some idea of the splendor of this place of worship. I was particularly moved by seeing the burial place of missionary David Livingstone as well as the burial place of my favorite composer, George Handel. However, what impacted me the most were the words of Revelation 11:15 written on the wall of this abbey, the place of the coronation of the kings and queens of Britain down through the centuries. and of His Christ; and He shall reign forever and ever." What a profound reminder that the kingdoms of this world will pass away, with all of their strength and power as well as their faults and frailties. Yet, the God Who created the heavens and the earth, who still keeps watch over the nations, who always has His eye on the evil and the good, His reign will never end. One day we will see Him make wrong things right here on planet earth. What a day that will be when the kingdoms of this world are ruled by Him, when all tears are wiped away, when the lion and the lamb live at peace with one another, and He reigns forever and ever. I'm longing for that day! Thank you for this reminder, my dear friend. It's so easy to get caught up in things of this world in our everyday lives and forget the truth of the Word that HE is the ruler and we are His.